Do you follow politics with your teen? We have a dearth of real leadership in our country these days! No matter what your political persuasion, I think we can all agree with that statement, don’t you? Don’t worry: I’m not about to get on a political soapbox here, and I’m certainly not going to tell you how to vote or who to vote for, or what side to be on for any particular issue. But I would encourage you to remember, as I keep reminding myself, that even though it looks like we’re leaving our children a messed-up future, it IS their future – and they have the power and potential ability to change it for the better…if they are prepared! So, parents of teens, whether or not you homeschool, would you do me us all a favor? 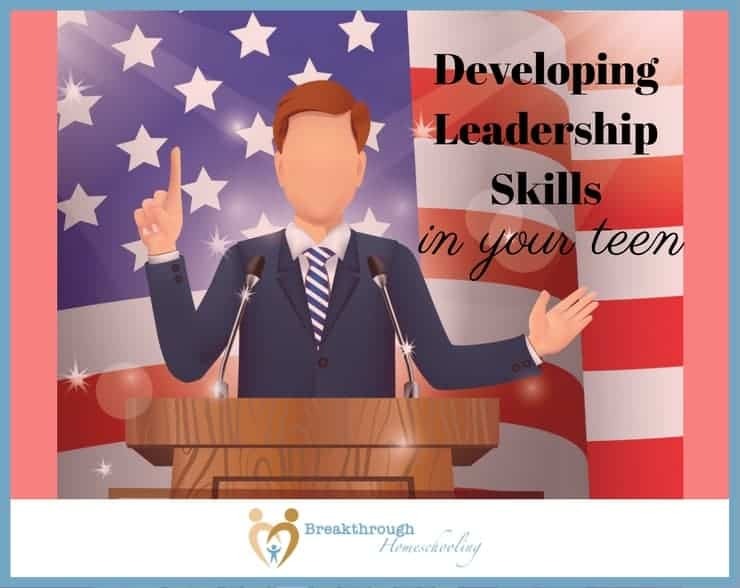 Prepare your teen to be a leader! Encourage them to read – books – preferably NOT on a Kindle – It’s not that I have anything against Kindles per se. But encouraging them to read “real” paper books, on topics that challenge them, will help them grow in ways that you may not even imagine. And paper books allow them to highlight, and underline, and make notes in the margins (yes, it’s ok to write in books if they’re yours), enabling them to make connections and engage fully with the content. Follow, and discuss, politics with them – Who knows where the discussions may lead? But help them to see the moral and/or ethical issues often involved, and help them understand the difference between politics and leadership (yup, there IS a difference!). Show them the links between our lives and the effect our leaders have on it. 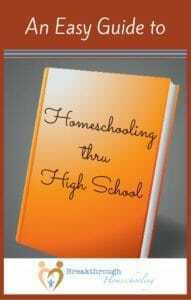 Try this Online Unit Study by the Techie Homeschool Mom, Beth Napoli. It’s a great introduction to elections and the political process as well. 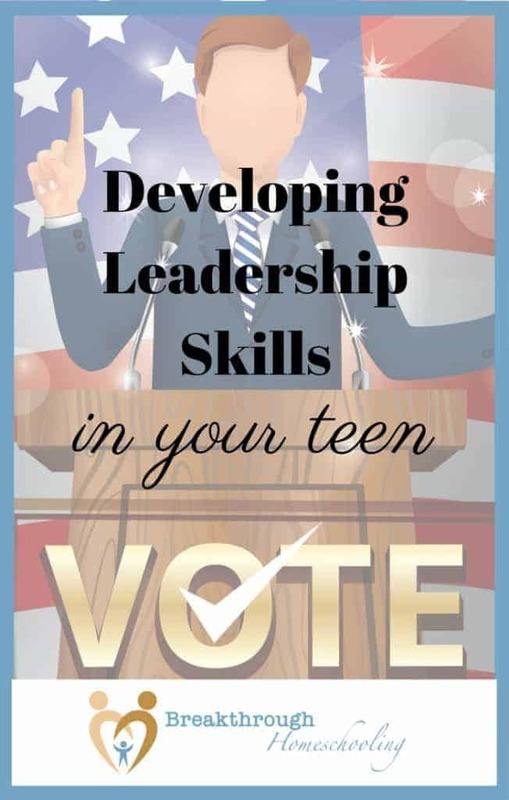 All About Elections is an Online Unit Study that not only will help you navigate the election season with your student, but will give you the tools to get him or her started on developing their own leadership skills! Ensure they study civics and government and American history, maybe study them together. And ancient history is important, too: we get many of our political principles from the Greeks and Romans. Also encourage them to keep up with current events. Use sites like CNN10 (a Student News channel) and ProCon.org to get the news in an age appropriate format. Give them opportunities to lead – Whether it’s in a Scout/AHG troop, teaching a Sunday School class, or Student Council or Key Club, or organizing a summer business or extra-curricular group of their own choosing… Often your local co-op will have some groups where this will be possible. Don’t succumb to the temptation to tell them how to lead, tho, or rescue them when they make a mistake, but be there to walk them through the lesson and help them learn how to bounce back up again. Dear Pat, I am very happy yu taking this series. I taught My kids at orphanage about this 2weeks ago on Leadership. I can’t wait for #5 article. Glad to hear you’re enjoying this series!! How wonderful to be teaching leadership skills to your kids – it’s SO important that we get them on the right track early – we will greatly need their leadership in the future. Hope #5 meets your expectations!! Pat I agree with leadership and not getting on my soapbox either, but so glad you are starting this series. It is needed in our country and in our homes. I’m with you on the books. I would not be where I am in not only my Bible study life but my college life had I not been able to highlight and markup and take notes. What a difference it makes in grades and in our walk with our Savior or at least it did for this girl. I go now and get all my Bible study books cut and a spiral added to them so they are easy to open and write in. Thank you for the link-up. Have a great week. Yeah, I’m kinda on a quest here to open our eyes to the opportunities we parents in general and homeschoolers specifically have to MAKE a DIFFERENCE through our kids! We’re living in crazy dark days; if it weren’t for the hope I have through The Word…well, I honestly don’t know how people can keep going without it. Off my soapbox now (or should I say again?)! And thanks for stopping by…hope to see you soon! Thanks for featuring my post on humor in marriage! What a blessing it is to share something with your spouse that is both fun and beneficial to you. Off to find something funny to send to the hubby at work today! Great idea, Pat. Raise up the next generation of leaders in and through our sons and daughters. Hopefully that will help to redirect our nation toward better values and choices. It is a future that is scary without that ambition and especially without the hope and direction the Lord can give. That’s how I’ve been dealing with this dismal election–praying for the candidates and the election. Thanks so much for the linkup, my friend! Love that you stopped by again today; I’m heading off to your “mess”, now – so see ya’ there!! Have an awesome week, friend! And Marilyn, on behalf my family, and I’m sure many of our readers, I am SO happy you choose to share them with us!! Thanks as always for stopping by <3...have a great week!